The latest over-ear wireless headphones from Beats cost $300 if you buy them from Apple. That’s a lot of money to spend on headphones, especially when you can get a pair that’s even better for a small fraction of the price. The Ghostek soDrop 2 Premium Bluetooth Headphones typically sell for between $70 and $80, offering sound quality and battery life that are as good or even better than anything you’ll get from Beats. That makes them an outstanding value at any given time, but there’s an Amazon sale going on right now that makes today the perfect time to pick up a pair. 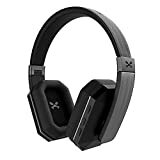 soDrop 2 wireless headphones have dropped to just $55.95 using the 20% coupon on the product page, beating their lowest price ever from Black Friday 2017. You won’t find headphones this good for twice the price, so definitely check them out if you’re in the market for new headphones.